We’ve exhausted the teams with zero, one or two no-hitters, so we move now to a pair of teams with four no-nos. The Seattle Mariners, No. 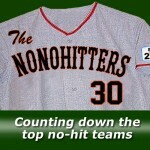 23 in our NoNoHitters 30 countdown, is an expansion team that began play in the American League in 1977. Randy Johnson threw the Mariners’ first no-hitter in 1990, and Chris Bosio added one in 1993. The Mariners threw a combined no-no in 2012, beginning with six innings from Kevin Millwood and short relief stints by Charlie Furbush, Stephen Pryor, Lucas Luetge, Brandon League and Tom Wilhelmsen. Felix Hernandez threw a perfect game for the M’s later during the 2012 season.